Has an individual law practice – Kancelaria Radcy Prawnego Sylwia Jeżowska. Studied law at Humboldt University in Berlin and Szczecin University. She is also a graduate in postgraduate studies in Company Law from the Warsaw School of Economics. 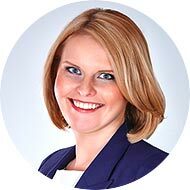 Her professional experience dates from 2005 through practicing in numerous Polish and German law firms. She specialises in providing legal services for business, in particular in the area of IT, transport, and real estate. She speaks German and English fluently, including legal language. She is qualified as court mediator. She constantly strives to improve her professional qualifications. Has an individual law practice – Kancelaria Radcy Prawnego Marta Dalkowska. Studied law at Szczecin University. She is a graduate in postgraduate studies on Taxes and Revenue from the Poznan University of Economics. She has also taken part in courses on tax optimisation and obtaining EU subsidies. She has been practicing in the legal profession since 2005, through working in law offices. She specialises in providing legal services for businesses, in particular in the area of construction and transport, as well as retail and wholesale trade. Her work also focuses on providing services for individual clients. She is also experienced in representing clients before common courts. She speaks fluent English, the language of law included.